Classic recipe which has been modified over time. I hope this classic Italian recipe becomes one your favorites as well.You will love how easy this recipe is. You will notice white wine is used instead of red. Its gluten free, nut free, and dairy free. Add the diced capsicum, onion and garlic to the same pan and saute over medium heat until the onion is tender, about 5 minutes. Season with salt and pepper. Add the wine and simmer until reduced by half, about 3 minutes. Add the tomatoes with their juice, broth, capers and oregano. Return the chicken pieces to the pan and turn them to coat in the sauce. 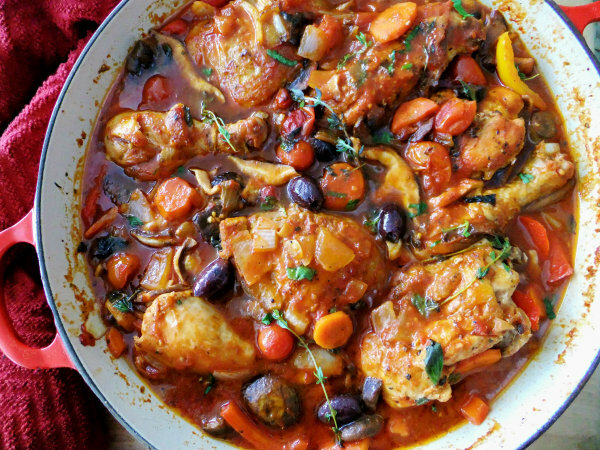 Bring the sauce to a simmer and add the olives. 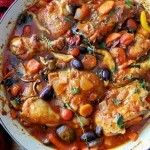 Continue simmering over medium-low heat until the chicken is just cooked through, about 20 minutes. Add in the fresh basil and stir through. Using tongs, transfer the chicken to a platter. If necessary, reduce the sauce until it thickens slightly, about 3 minutes. Spoon off any excess fat from atop the sauce. Spoon the sauce over the chicken.